Stay three nights in ANY room type and enjoy 15% off your entire reservation between May 1st - December 31st! 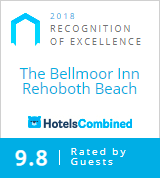 Enjoy our spacious guestrooms and suites appointed with every luxury, our first-class service, and the elegant atmosphere of our iconic hotel in the heart of Rehoboth Beach. Choose to stay during the bustling summer season with the town teeming with excitement, or opt to experience extravagant fall festivities with this special! Have the flexibility to stay when it is most convenient for you and still enjoy savings! 15% off entire reservation; valid on ANY room type. Not valid on existing reservations. Cannot be combined with other specials or offers.